Wildfires in the Gatlinburg area are spreading rapidly today due to high winds. 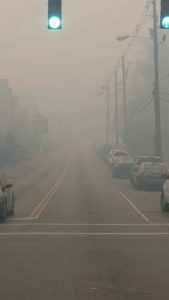 The town of Gatlinburg is filled with smoke-haze to the point it is making driving difficult and breathing very difficult. Gatlinburg Fire Department is going door-to-door asking residents to voluntarily evacuate to a Red Cross evacuation shelter set up at the Gatlinburg Community Center located at 156 Proffitt Road. Residents needing transportation may call the Gatlinburg Police Department at 865-436-5181. The National Park Service reports more fire growth in the park over the next 8 hours with the potential for spot fires to form outside of the fire area. Gatlinburg Fire Department will continue to monitor the situation and the Tennessee Division of Forestry has staged equipment in the Mynatt Park community.